What To Do In Case Your Car Breaks Down? The very first thing to do after your experience a breakdown is to activate the hazard lights and parking lights immediately. This will help other drivers notice your car from a long distance and they will probably not drive too close to where you are parked. If you suffer a complete breakdown, keep seated inside your car and fasten your seat belts. This will protect you in case a vehicle accidentally bangs into your car. If you are able to drive your car a little, try moving to the side of the road. The idea is to find the safest spot available on the road and park there. If you are parked at a safe spot, try to carefully exit the vehicle and place the cone or triangle warning sign (breakdown indicator sign) close to your car. These are provided in the car kit by most car manufacturers. These will provide some space for you to move around the car and try to find the cause of the breakdown. In case it’s raining when you suffer a breakdown, do not keep the bonnet i.e. the hood of your car open for long intervals of time. Water could seep into the engine and make the situation worse. Keep seated in the car if you cannot find the cause of a breakdown. Make a call for help by getting in touch with your car insurance company or by calling a car towing service. Your insurer may help you hire a towing service or a mechanic. 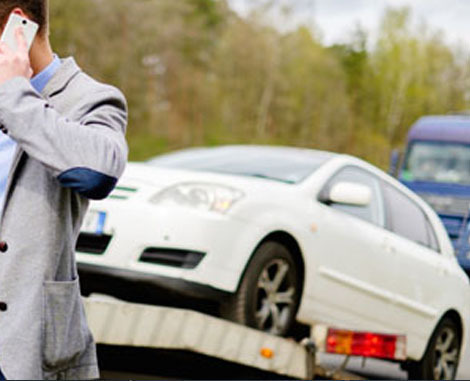 The best case would be when you have availed a Roadside assistance cover while buying your car insurance policy. The Roadside Assistance Add-on can prove to be a boon in a breakdown or at the time of an accident. Being an Add-on i.e. additional coverage, you can buy it only with your comprehensive car insurance policy and not with a third-party liability policy. Roadside Assistance Add-on provides a number of useful services like helping you change a flat tire, jump start a dead battery, towing service, minor onsite repairs, emergency fuel refill, , and more. How Is Car Insurance Helpful? Car insurance can be useful in situations like car breakdowns and accidents. However, this depends on the type of coverage you choose. It is mandatory to at least buy the basic car insurance policy to drive a car without facing penalties. Through a car insurance policy that offers adequate coverage, your insurer will cover you for the cost of repairing damages. This damage could be to your car or any other property. Compensation for death or injuries is also covered under car insurance.